Shapify.me – 3D-printed teeny tiny selfies from your living room #3DThursday #3DPrinting #3DScanning « Adafruit Industries – Makers, hackers, artists, designers and engineers! Microsoft Kinect users can now scan their bodies with the motion capture device and order a 3D-printed miniature model of themselves without leaving the house. 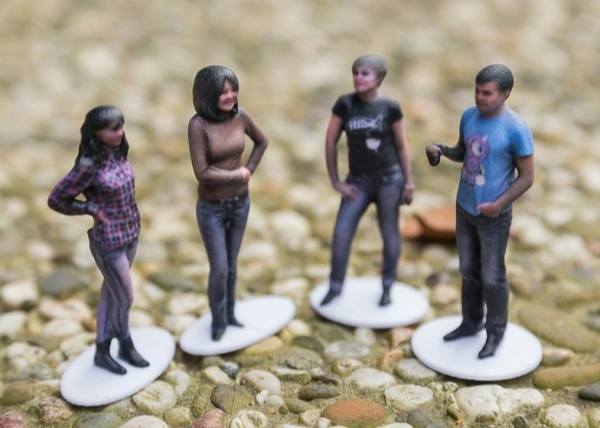 Developed by 3D scanning company Artec Group, Shapify.me offers a printing and delivery service for “3D Mini Me” figurines. To create the tiny model, users can download an app to their computer and pair the machine with their Kinect device. The Kinect must be positioned at chest height on the edge of a surface. The subject stands in front of the device, just over a metre away. After striking the desired pose, the individual scans themselves and then turns 45 degrees before scanning again. This is repeated until a full rotation has been made and the same pose has to be held throughout. The scan is calculated and appears on the screen so it can be viewed from various angles to check if it’s okay. By pressing the 3D print button, the model one twentieth of the real height is ordered and delivered in the post in a matter of days. Figures can be ordered with or without a white stand. The system is currently compatible with Microsoft Kinect for either Xbox 360 or Windows.